The last base of the reads can be anything other than A. Has anyone ever come across this before? QC shows nothing else of concern. 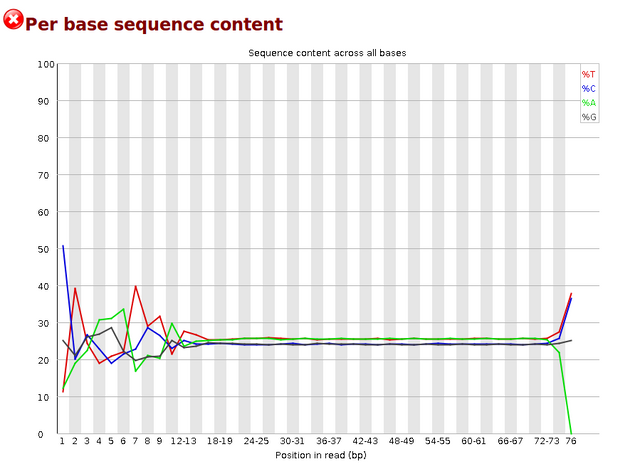 No adaptor contamination, no over-represented sequences, normal looking per read GC content. If you do a google image search with fastqc per base sequence content you will see examples of similar profiles. I noticed that before, but not with RNAseq. It was a kind of artificial set up, where the sequence of interest was exactly 42 bases long, and so we sequenced for just 43 bases (so that there would be 42 bases with post-phasing data). And I noticed that a lot of reads had the last letter trimmed, but only if it was expected to be an A.
I remade the fastqs by turning off adapter trimming in the sample sheet, and that made all the reads 42 bases as they should be. We were using a pretty old version of bcl2fastq for a while, so I can't vouch for the fact that newer versions will show this same behavior. Yes, I'have seen that before as well (at least for DNA reads). It's a typical pattern for the read length +1th base, that base is near crap so it should (needs) to be removed anyway. That it's indicates it might be anything but A I'm not sure on (will need to check). Why 50bp Illumina run produces 51bp long sequencs? Thanks. Quality trimming didn't remove this, but I'll have a go at hard trimming the last base. Normally I'd think that hard trimming the reads was just masking a problem. If I understood correctly that last (extra base) does not get trimmed because it's 'rescued' by the previous bases I'm guessing that if you would put the window size to 1 with a low Qvalues it will get trimmed. Should I to trim the first bases of RNAseq reads that contain 7_k-mer?